Happy Wednesday! 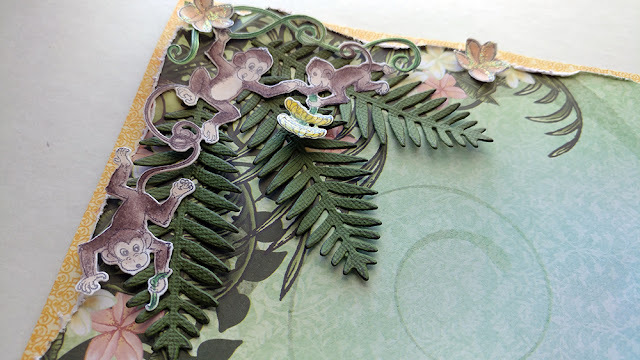 I have another layout to share with you today using Heartfelt Creations newest collection-Monkeying Around Collection! Cut out a 7.5" circle and distress the edges. Make a wavy edge on a 12" x 12" sheet of pattern paper and distress the edges as well. 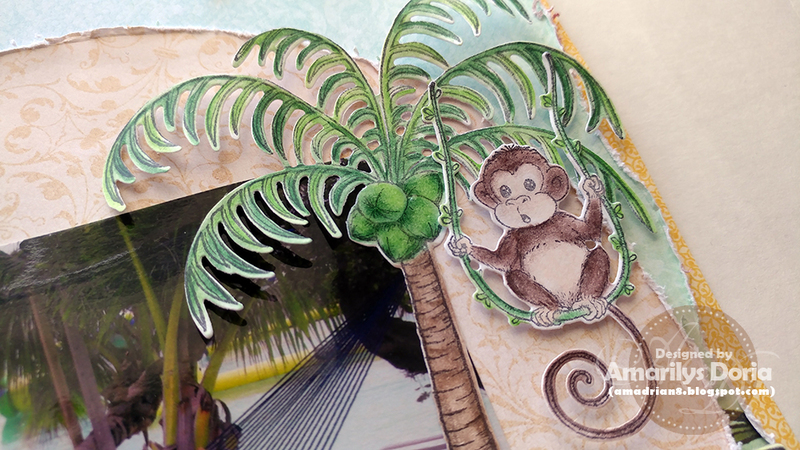 Mat with a coordinating paper from the Monkeying Around Paper Collection and add the distressed circle to the bottom right corner. Add your 6" x 4" photo over it. 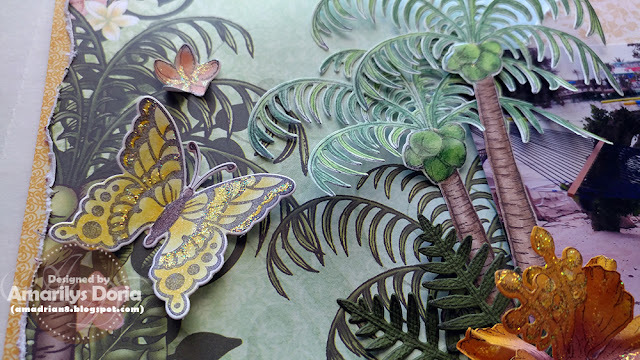 Stamp the monkeys, flowers, palm trees and butterflies on white cardstock. Color with Prismacolor Pencils and blend them with Odorless Mineral Spirits. 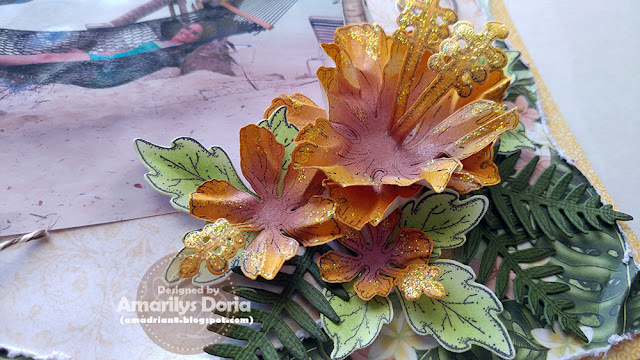 Stamp the hibiscus flowers and leaves and add color using the distress inks. Die cut using their coordinating die. Shape the flowers and glimmer mist them to add some shimmer. Set aside to dry. Stamp and die cut some leaves out of green cardstock. Add the monkeys to the layout using pop dots to give them dimension. Add the rest of the embellishments to the layout as shown. Fussy cut a title and add it to the top right corner over a small strip of distressed pattern paper. Oh wow...what a gorgeous and fun layout! 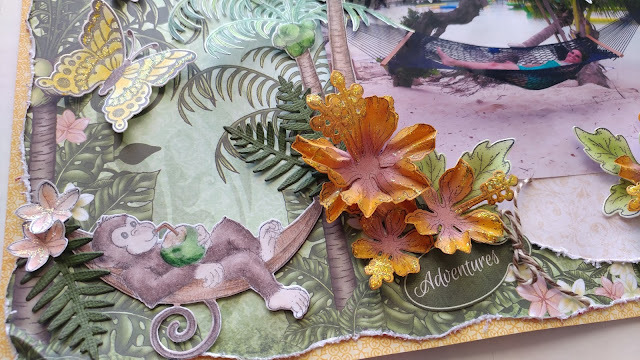 Amarilys, this is such a fun layout full of so many exquisite details! Fantastic design!